Current transformers are made in a range of measuring and protection type considering quality, accuracy and reliability as prime factors. 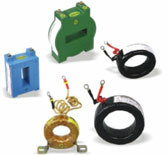 VOLTAMP Current transformers can be used for metric and imperial size bars. Current Transformers are made from high magnetic performance prime CRGO Silicon Electrical Steel. The performance of the core is checked to meet final parameters such as ratio, rating and accuracy. The current transformer is finally completed by placing PVC washers on top and bottom and then taped closely with polyester film and polyvinyl chloride tape. Proper lugs are provided on secondary terminals with S1 and S2 markings. Anodised Name plate is slipped within outer tape mentioning specifications and P1, P2 direction. Power Factor meters and Protective Relays. Dielectric Test : 2500 V/4000 V r.m.s. Test Voltage : 2500 Volts / 4000 V r.m.s.